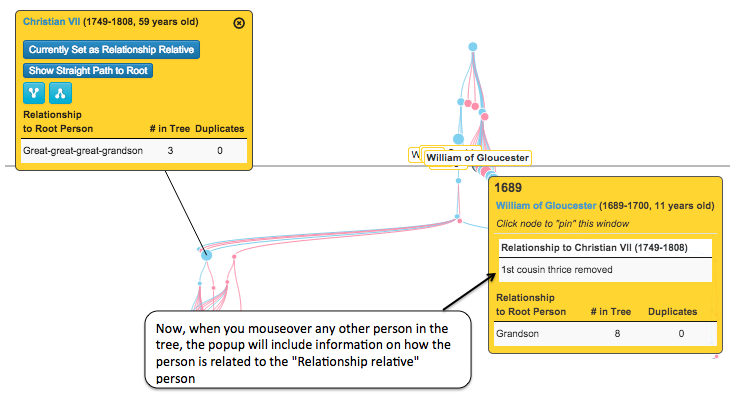 When I first started playing with this, I was focused on "ancestor trees", which starts with a person and shows all of their ancestors. I have added the ability to switch this so that you can see the descendant tree for an arbitrary person as well. 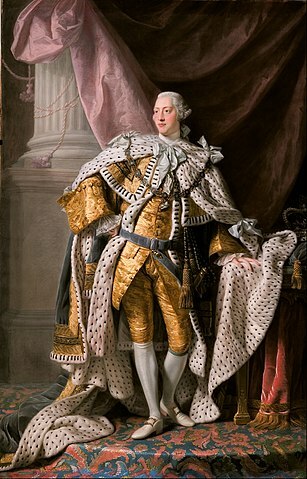 Part of the descendant tree for George III is shown below. There are two ways to get the descendant tree for a person. 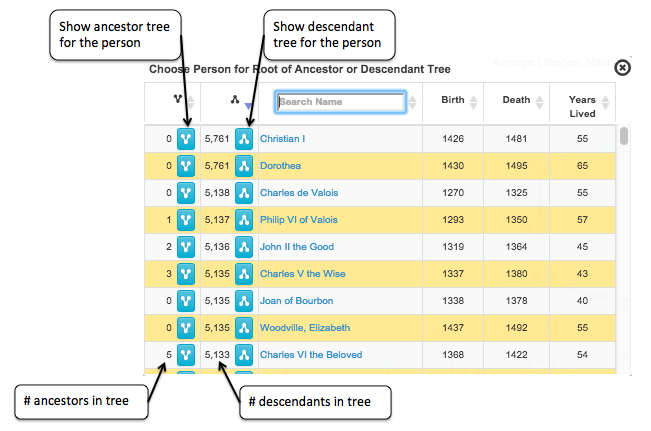 First, one can show the full table of people in the file and then pick to view the descendant (or ancestor) tree for the person. A screenshot of the table is below. Note that I used rotated versions of the Font Awesome "share" glyph as icons for the two types of trees, and it seems to work while using only a small amount of screen space. 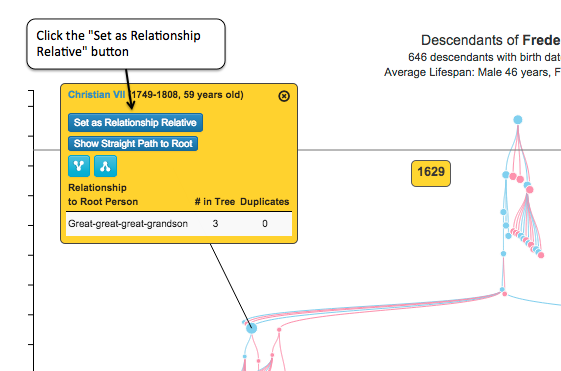 Another way to show the descendant tree for a person is to "pin" the popup for a person and then click the appropriate icon on the popup for an ancestor or descendant tree. How is one person in the tree related to another person in the tree? For descendant trees, you can see this now with the tool. The steps to do this are shown in the screenshot below. For trees with lots of pedigree collapse, two people can be related in various ways, and these will be shown with the tool. I've never really remembered all this "once removed", etc. stuff. Even after implementing it, I can't say that this has improved. Did you know there are two different ways to be a first cousin once-removed? That seems a bit silly. But I am not suggesting adding even more terminology here. Hosting on your own site? Someone asked me about hosting this on their own site, with the default to show their own family tree. I have set up the process for this, and would welcome any interested beta testers. All that is involves is copying static files onto your web server, creating your own GEDCOM file you want to use, and then make a simple change to a configuration file. So, let me know if you want to give it a shot! This has been a fun project to work on. There are still performance improvements I need to make (and I need to return to mobile screen styling), but on the desktop it seems to be able to handle some pretty large trees. On we go.